For an authentic feel of Mexican culture, visit Mercado 23 in Cancun, Mexico. Cancun is a vacation paradise—beautiful beaches, sparkling waters, temperate weather with sunny skies, and an estimated 30,000 hotel rooms offering enough options to satisfy every taste and pocketbook. But this popular tourist destination might be considered a victim of its own success. With English spoken everywhere, sophisticated continental menus, and large American-style shopping centers, some visitors complain this part of Mexico isn’t Mexican enough. “We speak English,” he said, and we all laughed forming a fast friendship. Mercado 23 is the oldest of a series of markets in the city. Removed from the manicured hotel zone, it’s immersed in the middle of a vibrant neighborhood inhabited by workers and their families. Eduardo promised it as the “real deal” and it was. He grew up a few blocks from the market and this is where his parents shopped when he was a kid. Now he takes his own children here to shop and eat, and immerse them in his heritage. “We’re losing the feeling of Mexico,” he said with more seriousness. Mercado 23 looks like it hasn’t changed since its inception in the 70s. It resembles a large open-air flea market with vendors operating out of a series of stalls (both interior and along the outside perimeter) that sell home goods like mops and detergents; school supplies; piñatas, candy and party goods; pet food; grains; pottery and crafts; fresh flowers and herbs; and still-fragrant local vegetables and fruits that aren’t waxed over like those in our supermarkets. It looks like the ancestor of a megamall coupled with a food court. The shops are open seven days a week from 7AM until dusk. Locals also come for haircuts and to get their tires repaired. There’s a stand that sells herbal products (botanicas) to cure any malady (perhaps a progenitor to GMC) and shoe shops for every sized foot. Religion is still dominant in much of Mexico and at this market, like many others there is a small capilla in its center with Our Lady of in Guadalupe, patron saint of Mexico, at the altar. The market also sells both religious and spiritual products. One of the biggest draws of the market, certainly for any foodie, are the wonderful cooked dishes prepared by vendors who have come to live and work here in Cancun from many different regions of Mexico bringing recipes from their respective regions and states. On the top left is a picture are the lomitas we tasted, freshly made corn tortillas topped with pork, egg and onions. On the top right is tacos de pierna, made from pork leg. On the bottom left is chicharra, decadently unhealthy but delicious pork crackling. The picture at the center is morcilla con carne higadilla (made with blood sausages, onions and habanero peppers). Of course, the nicest part of our visit was getting to interact with locals, both vendors and other customers. Not quite sure why the lady came to eat made up like a clown but she brought a smile to our face. The larger-than-life size fish was a locally caught grouper for sale by a fishmonger at the market. Not too many gringos visit this market. But in perfect English, the musician in the red shirt and hat asked where we were from. When we told him we were from New York, he began playing New York, New York and proudly told us about his half-Irish brother, a cop in Brooklyn whom he hoped to one day visit. While the market looks perfectly safe during the day, some say it’s dangerous to hang around after dark and that’s why the stalls close up. Unless you are proficient in Spanish, it’s best to visit with a Spanish-speaking friend or taxi driver. It’s best to visit early in the morning–all the foods are at their freshest and are most plentiful. Bring cash; this isn’t a place where plastic is accepted. Even better, bring pesos. While the vendors expect you to haggle, you’ll probably have a hard time haggling with people who are so warm and kind, and work so hard for a living. Located west of Avenida Tulum, it’s accessible by taxi or the Ruta 1 bus from the Hotel Zone. I really enjoyed your article. 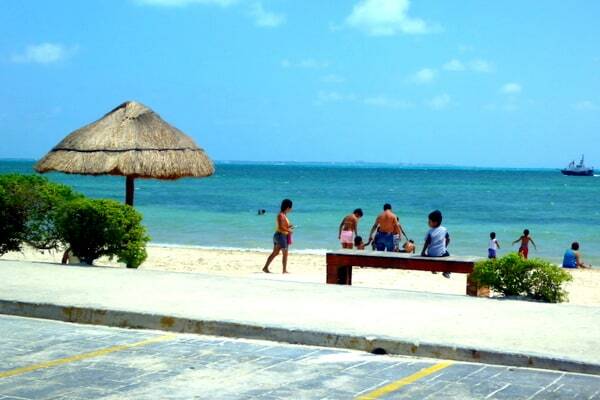 It is great you got away from the touristy part of Cancun and were able to see the real Mexico and make new friends! That looks like a wonderful market. Love the food shots! I’ll have to remember this if we get to Cancun. Your post brought back many warm and vivid memories of our time in the Yucatan Peninsula of Mexico. I especially enjoyed the food photos as, in my opinion, the food is number one is Mexico! I’m heading back to Cancun and Merida in a few weeks. I’ve been many times over the years, but I don’t believe I’ve been to Market 23. I’ll put it on my list! I love Mercados! I haven’t been to Cancun but I’ve been to Mazatlan and Cabo. The only thing I don’t enjoy at Mercados is the butchered animals sitting out. I’ll never forget turning the corner at the Mercado in Mazatlan and coming face to face with a pig head! I’ve been to the one in Cabo too. It is much smaller in size than this one. Haven’t been to the one in Mazatlan. I visited Cancun for the first time about 25 years ago and oh my has it changed! I like going there now, but I always remember that first trip and how it felt like I was immersed in a new country and culture. There’s nothing I like better when traveling is visiting a local market. The only down side? I usually don’t have a kitchen, so I have to look at rather than buy all the goodies! Agree that it can be quite frustrated to have no place to bring them home! We were in Cancun in March and stopped by Mercado 23 as well. I had to look twice at your picture showing the haircutting place to see if it was the one that we stopped at but I checked and it wasn’t. It is true that Cancun is like Miami but if you stay away from the hotel strip, you can definitely still find areas that are Mexican. I’ve been to Cozumel, Merida, Tulum and Playa del Carmen, but I’ve never been to Cancun other than to the airport. It was supposed to be a port call on a cruise we were on one year, but the waves were too high for us to stop there. It must have been a tender port. Your photos of Mercado 23 really capture the ambiance. Nice. It’s been years since we’ve visited Cancun – and it’s nice to read that one can still find some “authentic” experiences there (not frequented by gringos) :-). This market looks wonderful. I love finding local markets when I travel. Irene-great food shots. I love to check into a local market when I arrive at a new destination. Gives such a great overview and feel for the local culture. I’m glad you enjoyed Cancun and could get off the beaten path. It’s getting harder and harder to have an authentic experience and you and Jerry captured this one beautifully! Irene, I’ve never been to Cancun, but I think if I were to go this would be one of my first stops. I would have to eat lunch here! Love the pics! I haven’t been to Cancun since the 80s! I suspect a few things might have changed. 🙂 But there are still a lot of good reasons to go there, including the fabulous beaches. Glad that you were able to experience “the real deal” at the market while you were there. Looks like a must-see. Sounds like the real taste of Mexico. Thank you. I like your way of describing the beautiful Mexico especially the markets. Infact, I enjoyed reading your article. Mexico is really a different and interesting destination to explore. I used to love Cancun. I’ve been there so many times before the drug cartels started making a mess in Mexico. Too bad, it was such a lovely place. Mexico is a large country and there are still many areas that are safe. The U.S. State Department is a great source of information. Currently there is no advisory in effect for the areas surrounding Cancun. Nice to see a guide offering insight into the best specific locales to hit up to get an authentic experience out of Cancun. Thanks for sharing.